I know I’m the only person who is really interested in what I am going to say here, however, on the off chance that anyone notices, I’m taking a couple of weeks to sit on a beach in Belize. (Yes, the very one pictured here. It’s a photo I took myself some years ago.) Internet access is limited plus I just don’t wanna think all that much when I’m down there! I’ll be back in a couple of weeks. Perhaps there will be things to report. Or perhaps I will have simply further developed my taste for Belikin (“The beer of Belize”) and for rum punch. Hi Doug – I happen to be giving an arts talk next month about ideas for community and collaboration. You gave a great talk a few years ago that I really dug, so I thought to refresh with some of your musings only to see you’re hanging out in one of my favorite places! 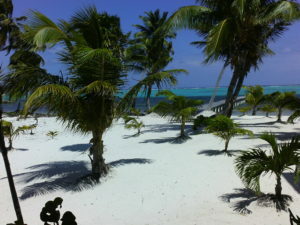 I agree: Belize is a great place to ruminate! I made a folkloric research trip there a few years ago to study Garifuna culture and music. Hanging out in Hopkins, I discovered some great insight about how we perpetuate our values and culture to younger generations. If you can get your hands on it this late in the year, the Belikin holiday seasonal brew with sorrel is phenomenal! Hope you have a great trip. Wash down a few conch fritters for me…. Thanks for the advice! And chillin’ is indeed happening.